Chlorophyll – known as “source of life”. It is the green coloring matter found in all leafy green plants and vegetables. It is often referred to as "the blood of plants" and is formed by a process called "photosynthesis". One characteristic of Chlorophyll is that it contains abundant natural minerals, vitamins, protein, trace elements and micro-nutrients. 4 times chlorophyll of ordinary vegetable. Anti-oxidant – help reduce free radicals in the body. ZINC - essential minerals found in almost every cell. It stimulates the activity of approx. 100 enzymes which promotes biochemical reactions in the body. Supports healthy immune system, needed in wound healing, maintain sense of taste and smell, is needed for DNA synthesis. Zinc supports the growth and development during pregnancy, childhood and adolescence. Selenium -a trace mineral essential to good health but required only in small amounts. Selenium is incorporated into proteins to make selenoproteins, which are important antioxidant enzymes. The antioxidant properties of selenoproteins help prevent cellular damage from free radicals. Vitamin E – a fat soluble, powerful anti-oxidant to protect your cells against the effects of free radicals, which are potentially damaging by-products of energy metabolism. Free radicals can damage cells and may contribute to the development of cardiovascular disease and cancer. Might help prevent or delay the development of chronic diseases. Also known to play a role in immune function, in DNA repair, and other metabolic process. Vitamin A - fat-soluble compounds that play an important role in vision, bone growth, reproduction, cell division, and cell differentiation (in which a cell becomes part of the brain, muscle, lungs, etc.) Helps regulate the immune system, which helps prevent or fight off infections by making white blood cells that destroy harmful bacteria and viruses. Vitamin A also may help lymphocytes, a type of white blood cell, fight infections more effectively. Vitamin C - a water-soluble, antioxidant vitamin, important in forming collagen, a protein that gives structure to bones, cartilage, muscle, and blood vessels. It also aids in the absorption of iron, and helps maintain capillaries, bones, and teeth. Other nutrients: folic acid, biotin, panthothenic acid, minerals such as calcium, cobalt, chromium, phosphorous, silicon, potassium, iron, etc. Cleansing – cleanses the digestive system, assists in purifying blood, eliminates bacteria, disinfects and detoxifies. Balancing – balances body acid- alkaline level, boosts the functions of the body system. Nourishing – assists in red blood cell generation, enhances oxidation process and stimulates cell regeneration. 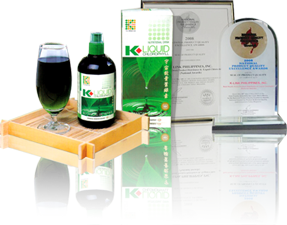 UIE Liquid Chlorophyll hence denotes Chlorophyll concentrates in liquid form that has been energized with UIE or Universe Induced Energy. UIE is a form of energy field originating from the first layer of the sun. Its discovery is a milestone in scientific achievements, as the energy proves crucial to the well being of mankind, animals and plants. The essence of UIE is that, when applied to living organisms, it improves and enhances their natural energy state there by resulting in increased health and well being. This tonic food constitutes one of the richest food supplements known to us today. One tablespoon of Chlorophyll mixed in a glass of water is like eating 1 kilo of vegetable. Recommended daily supplementation is 1 to 3 tablespoon.